How does Steinbeck make Lennie a sympathetic character? How does Steinbeck make Lennie a sympathetic character? In the novel 'Of Mice and Men', John Steinbeck deliberately creates and describes the character of Lennie and the events that surround him in the aim of evoking the reader's sympathy towards him. 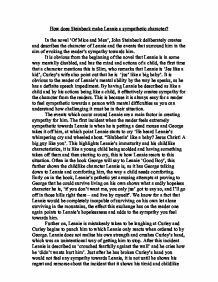 It is obvious from the beginning of the novel that Lennie is in some way mentally disabled, and has the mind and actions of a child, the first time that a character mentions this is Slim, who remarks that Lennie is 'Jes like a kid', Curley's wife also point out that he is 'jus' like a big baby'. It is obvious to the reader of Lennie's mental ability by the way he speaks, as he has a definite speech impediment. By having Lennie be described as like a child and by his actions being like a child, it effectively creates sympathy for the character from the readers. This is because it is always easy for a reader to feel sympathetic towards a person with mental difficulties as you can understand how challenging it must be in their situation. ...read more. Lennie does not realise his own strength and crushes Curley's hand, which was an unintentional way of getting him to stop. After this incident Lennie is described as 'crouched fearfully against the wall' and he cries how he 'didn't wanta hurt him'. Just after he has broken Curley's hand you would not feel any sympathy towards Lennie, it is not until he shows his regret and remorse about the incident that it shows his timid and childlike side again. No sympathy is felt towards Curley during this, because of the dislike built up against his character by this point even though he is the one seriously injured, all the sympathy is felt towards Lennie by the characters and the readers alike. After the encounter and being comforted by George, Lennie exclaims 'I can still tend the rabbits, George?' it shows how easily satisfied Lennie is and also how easy it is for him to forget major occurrences and get over them. ...read more. his hand over her mouth to stop her screaming, as he felt that him being able to 'tend the rabbits' would be jeopardised. This is Lennie once again looking out for himself. The sympathy felt towards Lennie is however regained, by the end of the book. Lennie is deeply remorseful about his actions and understand the burden he must be for George 'I won't be no more trouble to George', and how what he does affects everyone else. In this final part Lennie is more childlike than ever, he cries and worries and calls for George like a child for its parent. George finally shoots Lennie and kills him, believing it is the best for Lennie and everyone else, a sort of mercy killing. However, you do not feel deep sympathy towards Lennie at this point as in a way he is free now of his mental burden, in my opinion I am glad that this was what happened to Lennie as his shackles have been cut loose and he nor anyone else has to suffer. ...read more. 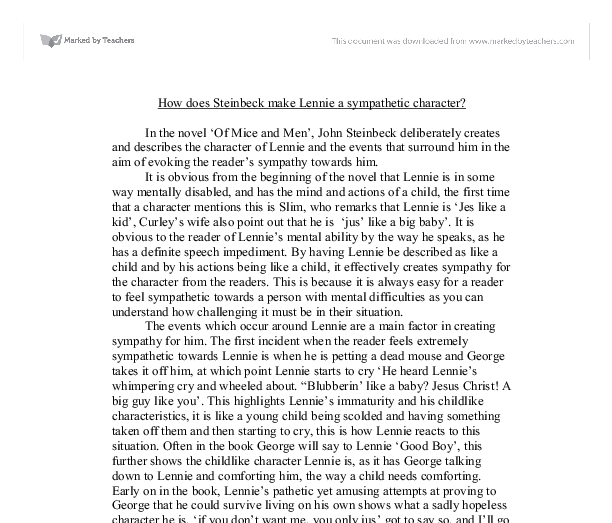 How does the author make Lennie a sympathetic character? this when he refuses to bring the mouse to George, he is like a "a terrier who doesn't want to bring a ball back to its master". He is also described as "a bull" and like "a sheep". "Lennie covered his face with his paws and bleated with terror". character who indulges innocence of a small boy without him realising it. He is not what he seems to be, in other words we can say that his physique does not match his personality. In comparison to George, Lennie is big, heavy, strong and not intelligent.